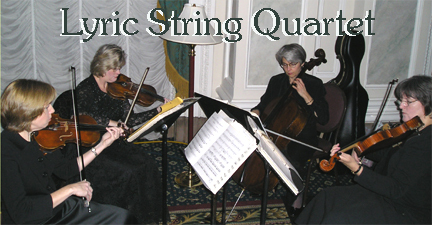 The Lyric String Quartet is an all female ensemble that has been playing together fifteen years. We play weddings, receptions, religious services, funerals, and other solemn and frivolous events. We are all classically trained musicians and amongst us we have played in the Richmond and Petersburg Symphonies and the Williamsburg Sinfonia. Our repertoire sheet is indicative but not inclusive of our entire repertoire. We offer two modes of dress: Concert black, which is black top and long black skirt; or a more European touch, white top and long black skirt. If in the event we must have a substitute musician and it is a gentleman, then he will wear a tuxedo. As contractor of the Quartet, I arrive one hour before we start to play. This is to assure that last minute changes go smoothly and communication with the wedding coordinator is facilitated. We do not attend wedding rehearsals. If there are any questions, please feel free to call me at 804.233.1642.